Isn't Muscat getting lucky in November? On the first day of Eid (Sunday November 6th) local event organizers, Meisan Events are throwing a concert at the InterCon gardens - Gates open at 6:30 and DJ Adam J from London will warm the crowd up until 8, when local artists SG & Sham open up for Shaggy until 8:30, when Shaggy's DJ takes over before Shaggy performs around 9. Tickets are on sale now and can be purchased at Costa Coffee outlets for General Admission (RO 20) or, for the fan pit (right next to the stage) you can pick up these for RO 35 from Totem clothing store. 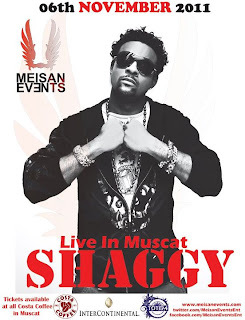 There is also an exclusive after-party that will be attended by Shaggy, for which tickets can be purchased (including access to the fan pit) for RO 60. 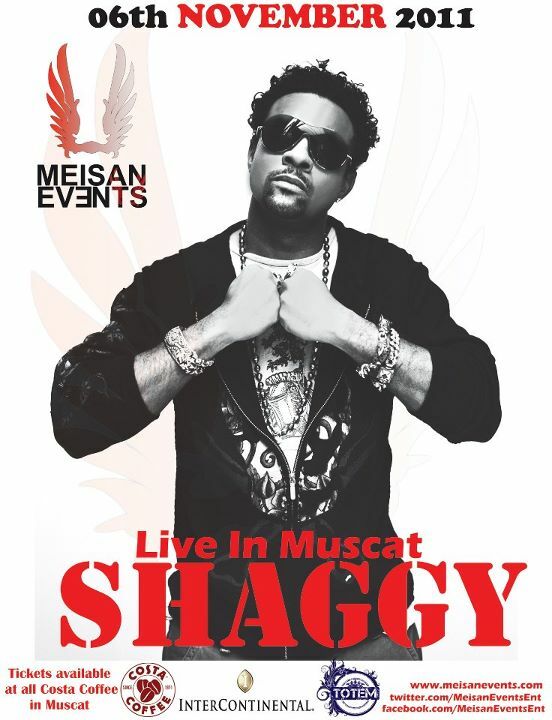 The guys at Meisan Event's have very kindly given me 2 fan pit tickets to give away to you lovely people! To enter, either email me at mrsythe [at] gmail.com or leave a comment here... if you leave a comment make sure there is a way for me to contact you! I'll announce the winners in a weeks time! You can check out the Facebook event page here, and Meisan Event's facebook page for more details. would it help if I emailed you 100's of times??? I want these tickets!! Mista Lova Lova!! Just when you think the totem pole of crappy musicians can't get any lower, Oman rises up to the challenge and books someone even less worthy of musical act status. I wonder who will be coming to Oman next? My bet is on Vanilla Ice and his Ice Cold Comeback Tour. Vanilla Ice at the Intercon - that would be typical. :) It would have been great if he visited 10 years ago. I agree with the anonymous comments above...Although it's good to see that at least someone is trying to bring entertainment to Oman, in terms of quality...we will get there in due time. haha, Vanilla Ice! very funny, this company called Meisan Events started off with playstation tournaments and now they are bringing you a concert and you say the lowest. If i was you i wouldn't beat my lips to the crap you just spit out. I am well assure that you will be the one at the gate fighting to get in. By the way, this company focuses on its fans and supporters, it has done more than what you will ever do for your country! I taught that dude everything he knows. Did someone win? I need the tickets badly. Winners give me the tickets and I will tell ya a joke that would make ya laugh for hours. It's worth it.